کریمی‌مشاور, مهرداد. (1391). برج‌ها و نقاط عطف؛ نقش برج میلاد در نمای شهر تهران. مجله علمی-ترویجی منظر, 4(20), 74-77. مهرداد کریمی‌مشاور. "برج‌ها و نقاط عطف؛ نقش برج میلاد در نمای شهر تهران". مجله علمی-ترویجی منظر, 4, 20, 1391, 74-77. کریمی‌مشاور, مهرداد. (1391). 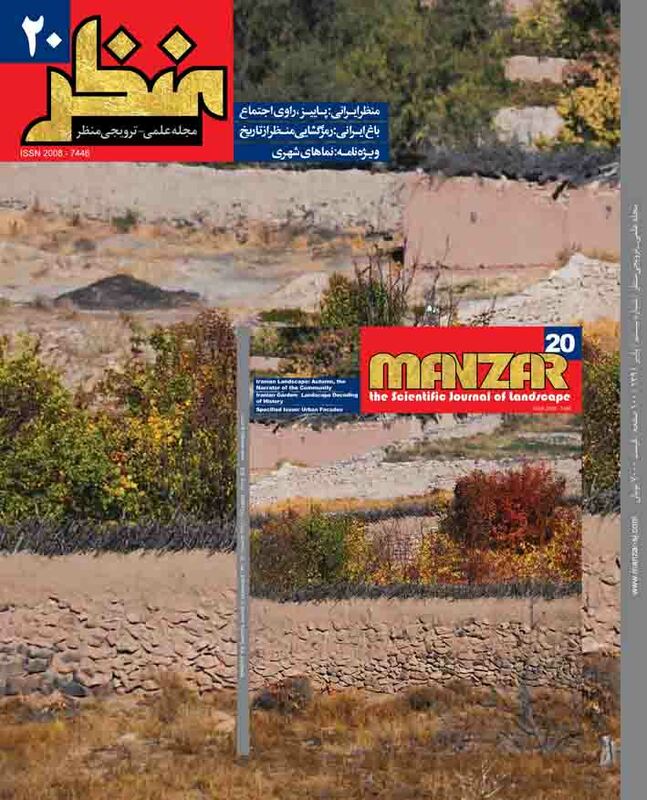 'برج‌ها و نقاط عطف؛ نقش برج میلاد در نمای شهر تهران', مجله علمی-ترویجی منظر, 4(20), pp. 74-77. کریمی‌مشاور, مهرداد. برج‌ها و نقاط عطف؛ نقش برج میلاد در نمای شهر تهران. مجله علمی-ترویجی منظر, 1391; 4(20): 74-77. حضور برج در شهرها از عوامل اصلی شکل‌گیری خط آسمان و سیلوئت شهر به شمار می‌رود. در خط آسمان یک شهر، برج به عنوان نقطه عطف واجد بار معنایی بوده و از اهمیت برخوردار است. نقش برج‌ها در شهر را می‌توان در ابعاد معنایی، زیباشناختی و بصری مورد بررسی قرار داد. علاوه بر ابعاد ذکر‌شده مقیاس تأثیرگذاری برج‌ها نیز از موارد حائز اهمیت است، که در این نوشتار در دو مقیاس خرد و کلان به آن پرداخته می‌شود. در مقاله حاضر به ویژگی‌های برج میلاد بر اساس چارچوب نظری مطرح شده و فارغ از بعد عملکردی برج، و در مقیاس کلان و تأثیر‌گذاری آن در نما و چشم‌انداز شهر تهران پرداخته شده‌است. در نهایت و بر اساس بررسی‌های صورت گرفته در این نوشتار می‌توان گفت برج میلاد به عنوان یک نشانۀ شهری نقش موفقی در شهر تهران ندارد. Among the significant contributing elements in shaping the skyline of every city are the towers. Every tower is considered a landmark which provides a profound meaning and importance to the city’s skyline. The role of towers can be discussed in semantic, aesthetic and visual aspects. Further than that the scale of their influence on the city is also noticeable, which is discussed in macro and micro scales in this paper. High-rises in different historic periods are considered and functioned as a tribune for presenting the society’s mind. Many obligations and requirements of different periods of history can be analyzed through tall monuments of many societies. Therefore, a framework of judging and interpreting the tall monuments is shaped. Considering the mentioned fact, it is necessary to know public spontaneous interpretation of high-rises. Unity, solidarity and continuity should also be considered in the design and planning of every unique tower. Nowadays, the height of the building is no more a concerning issue and more attention is paid to persistence of the building as a permanent cultural symbol in macro scales. Probably, the main problem in planning for Tehran city is the goal of achieving maximum height for Milad Tower and not achieving a tower which reflects local and indigenous symbols that can become global. Milad Tower does not properly match the skyline of Tehran and the city view. It can probably be concluded that it is connected inappropriately to the skyline, because there are less tall buildings in Tehran. This paper tries to discuss the influence of Milad Tower on urban façade and view of Tehran in macro-scale based on theoretical framework regardless of the functional aspects. Regarding the researches and studies it is concluded in this paper that Milad Tower has not been successful in representing Tehran as an urban landmark.